How much would you pay to become creative and innovative? You may only need to pay $16.47. 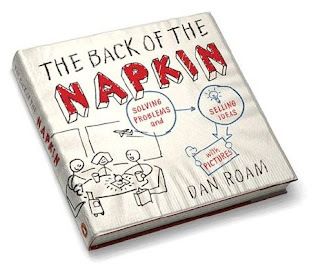 That’s the Amazon price of Dan Roam’s new book: The Back of the Napkin: Solving Problems and Selling Ideas with Pictures. Roam contends that any problem can be solved with what he calls “visual thinking,” a simple system of drawing. Don’t like your drawing ability? That’s ok, because Roam says it’s not artistic ability that matters. It’s time to open your mind to new possibilities and opportunities with visual thinking. Discover by taking advantage of our innate ability to see. Develop ideas in a quick, sketchy, intuitive way. Imagine new ideas from those patterns. Show – get it down on paper. Show a vision or execution? The way things are, or the way they might be? If you’ve ever said, “I’m not creative,” this is for you. Should You Use Features & Benefits, or Creativity?